If you’re one of the folks who read my last post, you know that I finally baked something tasty in our new house’s oven (which has been kind of hard getting used to, since it’s gas and only has a bottom heating element). Right now, anything that’s not a little over/under baked is a success, but this cake actually tasted really good, too – so I’m pretty excited. I’m learning to bake things on the very top rack, which feels wrong but it seems to work okay. We had a little lazy Saturday afternoon cake party and ate most of it before I could take any pictures, so the recipe will have to be a post for another day next week, after I make another one. I’ll give you a little teaser, though – this awesome cake uses lemon curd and Earl Grey tea. 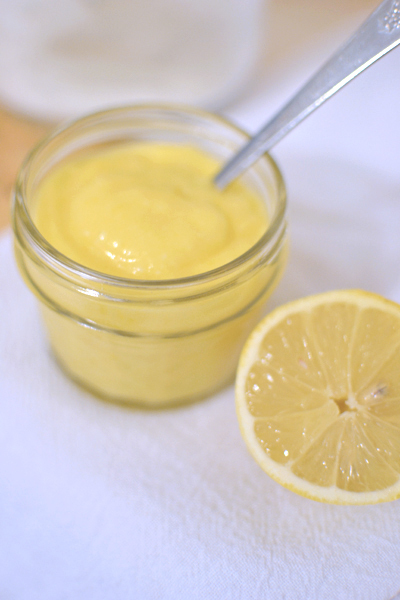 And so I thought I’d share my favorite recipe for lemon curd here, partly for posterity and partly so I can find it when I make this cake again for myself. Tags: baking, cake, dessert, gluten free, recipe, summer, vegetarian. Bookmark the permalink.